Theodor Seuss Geisel, who would grow to cement himself in history as Dr. Seuss, was born on this day in 1904 in Springfield, Massachusetts. Long before there was the Grinch and the Whos or fishes of red and blue, there was just plain ‘ol Theodor Geisel, who graduated from Dartmouth College then went on to study at Oxford University. He married his first wife Helen Palmer and eventually settled back in America where he worked as a cartoonist for a number of magazines. We all know and love The Cat in the Hat and Green Eggs and Ham, but did you know that Dr. Seuss also wrote some serious stuff? In 1971 he wrote Lorax, which dealt with the environment, and in 1984 The Butter Battle Book took a look at the arms buildup and the threat of nuclear war during Ronald Reagan’s stay at the White House. In 1990 Dr. Seuss came out with a book for young adults; Oh, the Places You’ll Go was a huge hit as a graduation venture-out-into-the-world gift. 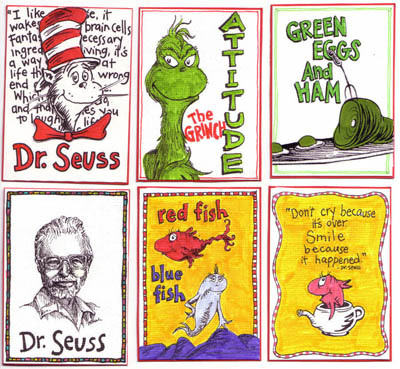 Dr. Seuss died in La Jolla, CA on September 24, 1991, at the age of 87. The latest movie adaptation of a Dr. Seuss classic is the upcoming Horton Hears a Who! starring Jim Carrey and Steve Carell. It’s not live action like How the Grinch Stole Christmas or The Cat in the Hat, but rather a beautifully animated and colorful film. previous post: Today Is February 29th. Do You Know Why? next post: What A Way To Make A Livin’! We feel really blessed and lucky to have an original, autographed Cat in the Hat sketch from Dr. Seuss. Truly, the man IS an American icon. You do? I’m jealous! I had some trouble learning to read when I was little and Dr. Seuss was a HUGE help. He’s an American icon and a literary hero. Well, he is to me anyway. 51 queries in 0.840 seconds.